You can also send a mass email using templates from the Communication Center. 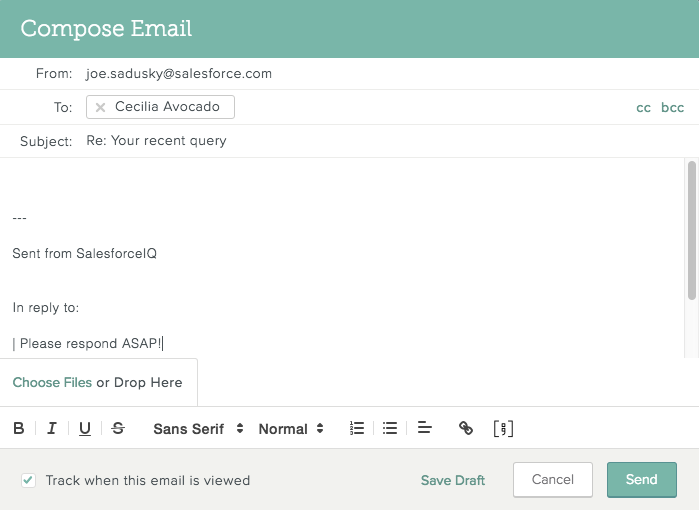 Note: You must have an email account connected to SalesforceIQ for the email functionality to work. Learn how to connect a Gmail account, an Exchange account, or an Office 365 account. On the screen that appears, enter the email address for each message recipient. 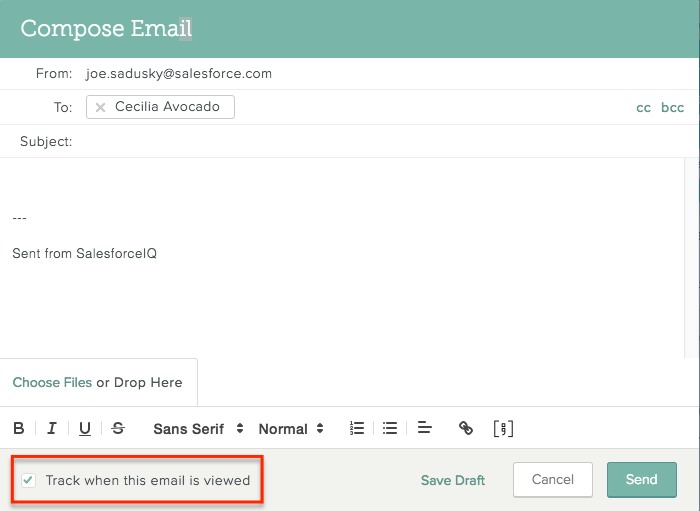 If a recipient has more than one email address, select the correct email address by hovering over the recipient name or email address in the To field. This displays all of the email addresses you have for that Contact so you can select a different one. 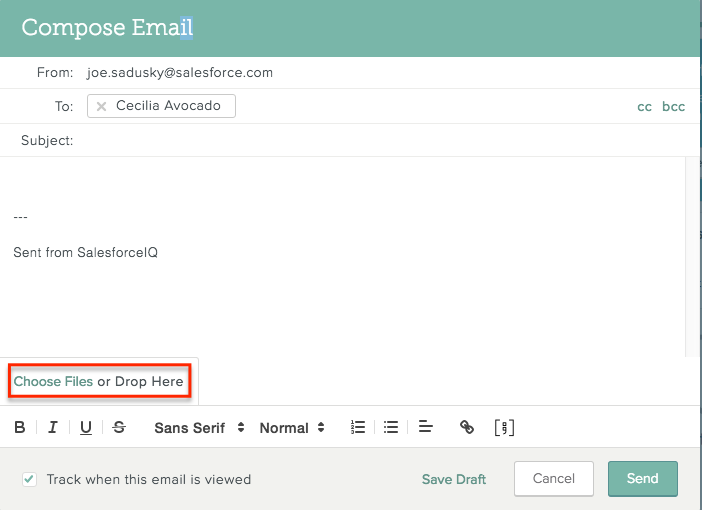 SalesforceIQ always defaults to the email address that has been designated as primary for that Contact. Enter the message subject and body. To attach a file to your message: Click Choose Files and browse to the file, or drag and drop the file to the section marked Choose Files or Drop Here. To customize the message text with different styles (bold, italics, etc. ), font, size, and formatting (bulleted list, numbered list, etc. ): Choose any of the options from the toolbar. To add Shortcut text: Click and select an email text Shortcut. To receive a notification when the message is read: Check the box at the bottom of the compose screen. Uncheck the box if you don't want to receive a notification. Click Send to send the message now, or click Save Draft to save the message as a draft. Note: To access your draft messages, click at the top of any screen and click Drafts in the left navigation panel. Your message drafts appear to the right. Click one to open it. You can then finish composing the message and send or save as draft again. It was sent or cc'd to you via your connected Gmail or Office 365 account. It was shared in the Stream. 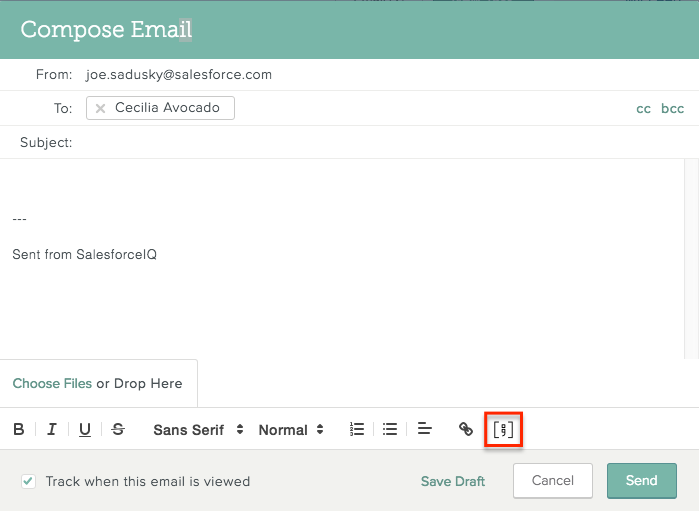 Hover your cursor over an applicable email message and click (Reply) or (Reply All). 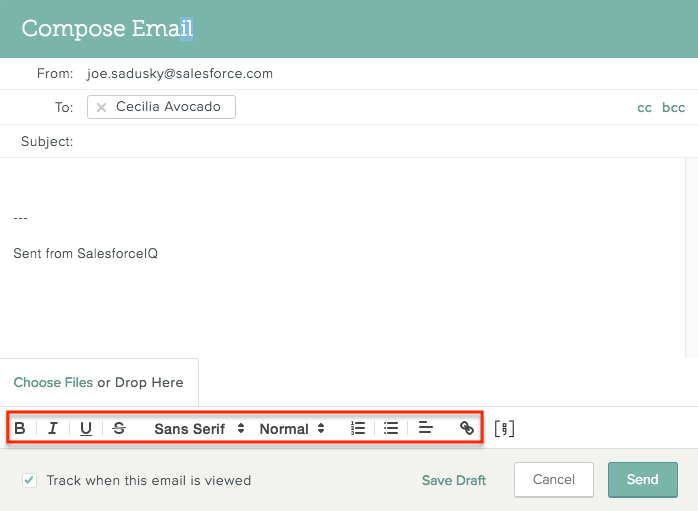 On the Compose screen, the From field defaults to your primary email address, or the email address associated with the email message in the Stream. The To field defaults to the sender's email address associated with the email in the Stream. If you or the recipient have multiple email addresses, you can select another address by hovering over the displayed name or address. Enter the message body text. 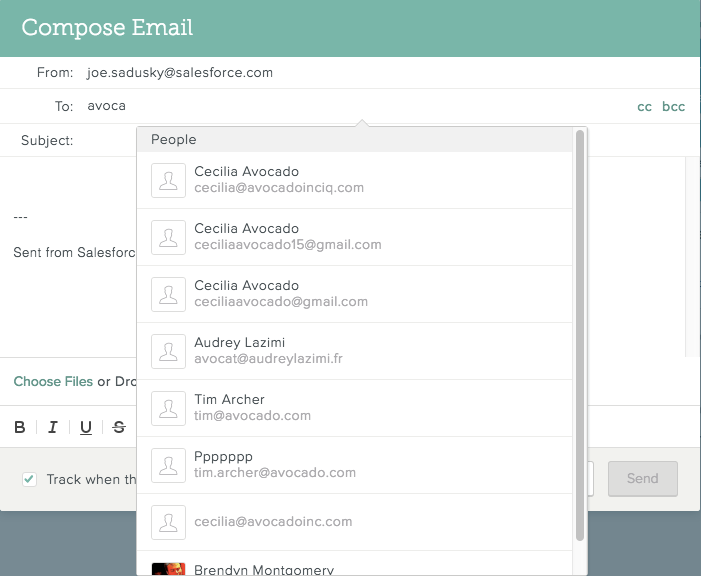 You can easily email multiple Contacts on a single relationship from the Stream. At the top of the Stream view, click X Contact(s). At the bottom of the screen, click Email All. Compose and send your email following the steps in Reply to Emails From the Stream, above. 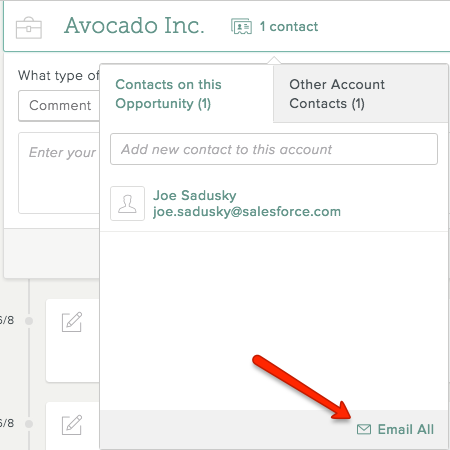 Check the boxes to the left of the Contacts you want to email. 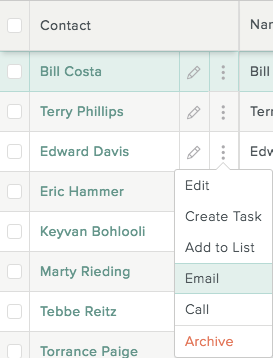 Note: You can also email a single Contact from the Contact Gallery by clicking to the right of the Contact name and selecting Email.